In the past I've commented about rappel stations in the Gunks. Many of the community rappel stations get junked up with lots of extra webbing. People feel the need to add slings to any already strong fixed rappel tree to "strengthen" it. They're essentially leaving garbage, as many of these stations already have several pieces of very strong, relatively new webbing on them. This summer I noticed the same phenomenon on rappel stations in the Cascades. Fear seems to induce the act of leaving behind webbing or cord for many recreational climbers. Most days I come home with a pile of semi-worn webbing. 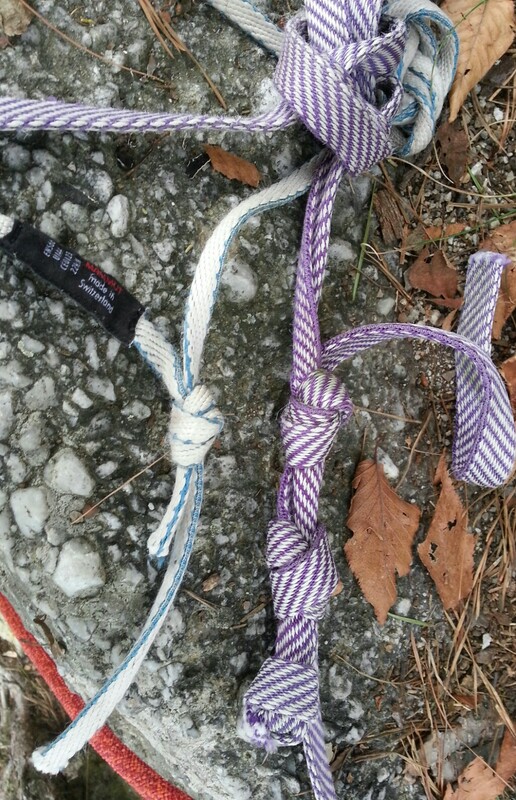 I cut the oldest slings off of the Gunks anchors I encounter, leaving two or three of the best pieces remaining on the tree. Fear does the opposite thing for me. 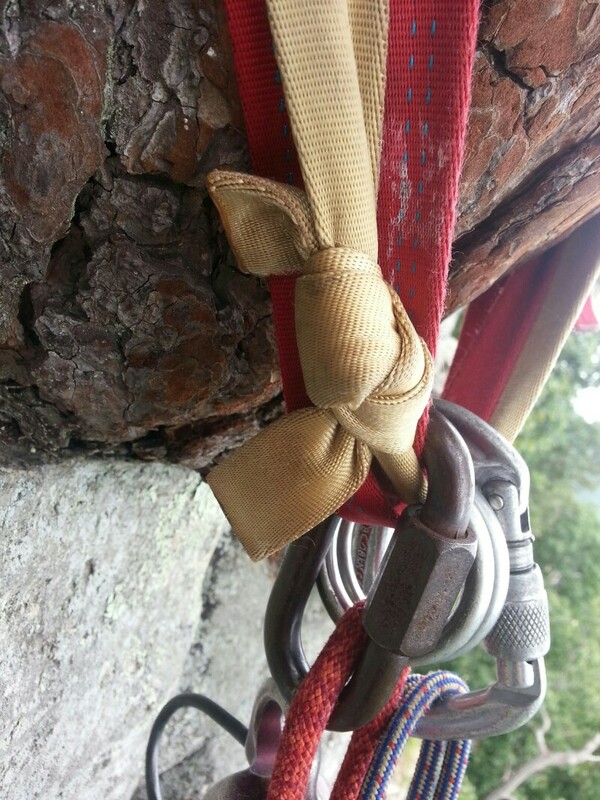 I'm more scared for others, and what they don't see when there's 8 pieces of worn webbing on a rappel anchor. Recently I've noticed water knots tied in webbing with very short tails and water knots tied using dyneema. Two little red lights should go on after reading the last sentence. Hopefully it's obvious. If not, read on. So, what are the two causes for concern mentioned in the first sentence of this paragraph? Well, for starters, the water knot has been shown to slip over time. Cyclic load tests using an average person's body weight have demonstrated that the outside layer in a water knot slowly pulls through the knot. What this means is that each rappeller shortens the outer tail on the water knot when they load and unload the anchor during rappelling. Over hundreds of cycles (hundreds or thousands of rappels) one of the tails gradually slips until it passes through the knot. There are two ways to manage this situation. The first is by using a knot other than the water knot. We're conditioned to think that the only knot you use to tie webbing is the water knot, but the double fisherman's knot (grapevine), while messy looking, actually has better overall holding power throughout cyclic load testing. So, one solution is to use a double fisherman's knot in place of a water knot. The other solution is to tie the water knot using very long tails. That way the tail will take much longer to pull through. Either solution is fine. Either way you should always inspect your rappel anchors before using them. My second cause for concern is over the use of Dyneema runners at rappel stations. Dyneema is very slippery. In this video, DMM tests water knots tied in spectra/dyneema slings to show what happens to them when they're loaded statically and dynamically. The results are interesting and should help you decide not to use Dyneema slings in this fashion. Wikipedia mentions that Dyneema's coefficient of friction is comparable to that of Teflon. Yes, pure dyneema is tougher than steel but as slippery as Teflon. Skinny dyneema slings don't hold knots well. That's why they only sold as pre-sewn runners. 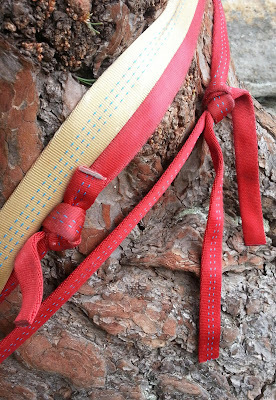 Tying Dyneema runners around a tree as a backup is a misapplication of the product and demonstrates a lack of awareness about the materials one is using as a climber. Shouldn't we all be aware of how our actions will affect us and others in this very dangerous sport? The bottom line here is that we, as climbers, need to use the right techniques and materials at the right time in order to be as safe as possible. If you're unsure about how to use something properly don't be afraid to ask for help.